"Substance Use Disorder, like other chronic diseases, requires an extended, chronic management model", stated Jacob Levenson, CEO, MAP Health Management. 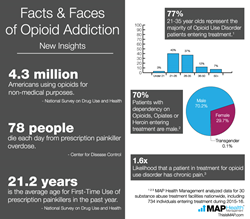 MAP Health Management, LLC, recently released addiction treatment outcomes data that indicates the majority of adults who enter in-patient treatment for opioid dependency are young males. MAP reviewed patient data from 30 addiction treatment facilities, including a total of 2,281 individuals who sought in-patient treatment for opioid dependence, during a 12-month period from 2015 to 2016. The data set consists of individuals who, upon completing treatment, participated in extended, post-recovery support delivered by professionals using telehealth practices. A review of MAP’s aggregate data found that males between the ages of 21 and 35, comprise 77 percent of those who enter treatment for a dependency on opioids, opiates, and/or heroin. In addition, 70 percent of the individuals represented are male. Based on the findings, individuals who suffer from chronic pain are 1.6 times more likely to develop a dependence on opioids. Extending the care continuum for individuals following the completion of residential treatment significantly improves the likelihood of effectively managing the illness. Based on widely accepted research, it is known that the risk of relapse decreases following 12 to 18 months of sustained recovery. MAP Health Management is the nation’s leader in the provision of a comprehensive, accessible technology platform designed to improve treatment outcomes for patients treated for addictions and other behavioral health illnesses. MAP provides telehealth services, recovery support programs and revenue cycle management to its clients. Nationally recognized treatment facilities trust MAP to help them navigate and thrive in the new healthcare paradigm by utilizing the latest data-driven technologies. MAP’s dedicated teams of research analysts, clinical directors, recovery advocates, technology professionals and billing experts work to improve patient outcomes, empower treatment providers with data, reduce costs, and drive facility revenue. For more information, go to http://www.ThisisMAP.com. For Data Infographics, go to https://thisismap.com/insights/data-infographics.